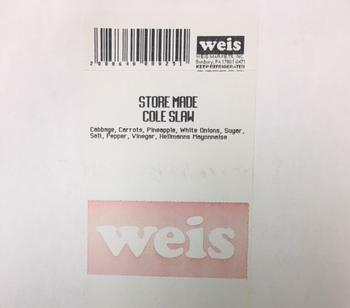 Weis Markets is recalling its store-made Weis Quality Cole Slaw sold in 1-lb. containers. The product, made in the seafood department, contains egg, an allergen not declared on the label. There have been no reports of allergic reactions related to the consumption of this product to date. The recalled product, with sell by dates of March 21– 24, 2018, was sold in eight Weis Markets' stores in the Binghamton, N.Y., area. Customers who purchased the recalled product may return it to the place of purchase for a full refund. Consumers with questions may call 1-(866) 999-9347, option 5. Monday – Friday, 8am to 5pm (EST).